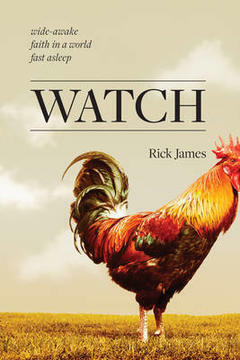 Watch by Rick James "dives deep into the New Testament's teachings on spiritual wakefulness, calling Christ-followers to defy the darkness and remain awake as they await Christ's return. Because being awake--continually in prayer, watchful for God's will, expectant of open doors, cautious of sin, desiring to serve, eager to repent, continuously giving thanks, willing to witness, embracing of humility, overflowing with kindness, persevering in obedience--changes everything." This was a book I was looking forward to reading as I have noticed all around the world how Christians seem half asleep. To me, that means being politically correct, to being "luke warm", which is where Revelation 3:16 talks about being luke warm as worse than being cold. At least by being hot or cold you know what your beliefs are and stand by them. So I wanted to like this book before I even began, but was sorely disappointed by the first few chapters. The writing was too rambling for me, James veered off in so many directions within one chapter that it was hard to keep up. He stuck anecdotes, paragraphs from books, and life experiences that didn't seem to align properly with that the topic at hand was. I started to feel it was too academic, getting too deep and educational where a simple explanation would have sufficed. I got lost - fast. I ended up skimming the rest of the book. Where it gets hard is how to rate it. There were many, many good topics discussed (how we often we mistake the voice of God with our own voice, how evil truly does prowl around to tempt and destroy us in subtle, almost unnoticeable ways, etc.) but I felt I had to wade through a lot of unnecessary words/thoughts/quotes/etc. to glean those snippets of wisdom. I think a really good edit would have trimmed this book down into a more direct and readable book. This book was given to me by Tyndale Publishers in exchange for my honest review.